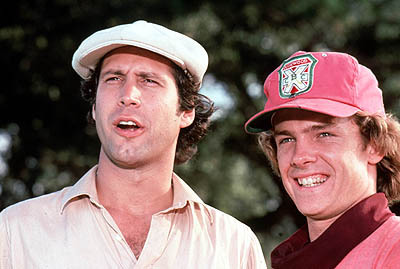 Each time I watch Caddyshack I appreciate it more and more. Sure the actual golf parts of the movie aren’t very well done (purposefully as it goes well with the script) but the humor and story are great. I also like the fact that it is rated R. It gives it a “real” feel especially when you think about what goes on during a round of golf and in everyday life. Bill Murray improvised the “Cinderella story” sequence from two lines of stage direction. Director Harold Ramis simply asked Murray to emulate a kid announcing his own fantasy sports moment. Murray simply asked for four rows of ‘mums and did the scene in one take. Cindy Morgan (Lacy Underall) has said that the oil massage scene with Chevy Chase was also completely improvised. When Lacy exclaims “You’re crazy!” that was Morgan’s genuine reaction to Chase dousing her with oil. Bill Murray filmed all of his scenes, including the famous scene with Chevy Chase, in six days. 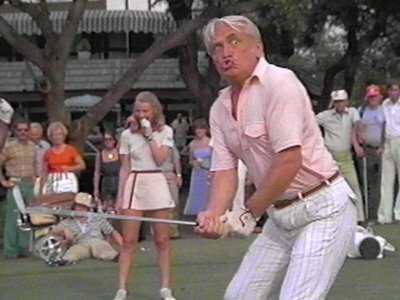 The character of Lou, played by the film’s co-writer Brian Doyle-Murray, is the only one to actually say the word “caddyshack”. 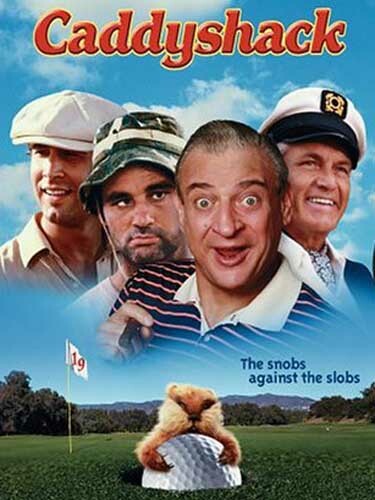 Overall it isn’t my favorite golf movie (I like the dramatic golf movies better) but it is my favorite golf comedy. Hopefully by reading this post it will make you want to watch this sports classic again. I just watched it yesterday and laughed harder at it than the time before and also caught a few things in it I hadn’t noticed before. Maybe if I watch it a few more times I’ll be able to buy and destroy the Caddyshack Trivia Game.